It is a testament to the love of hockey that the old hands at Esprit de Corps continue to hit the ice long after wiser heads have hung up the blades for less strenuous pursuits. Of course, there is more to it than the playing of the game itself: there is camaraderie on the team, an opportunity to reach out to the Canadian military officers and the diplomatic corps in Ottawa, and a chance to raise funds for the next generation in the form of the Cadet Leagues. Over the years some of the faces change, and for the first of two games in the last week of May, there was a scramble to find faces and legs who could take time off on a Tuesday afternoon to play another edition of the Esprit de Corps Cup challenge. The Ottawa Service Attaches Association (OSAA) Lame Ducks fill their roster with military attaches who do rotate out of diplomatic postings every couple of years. LCol Nico Huelshoff of the German Embassy finds himself in charge of a team that features a few players trying out hockey for the first time. 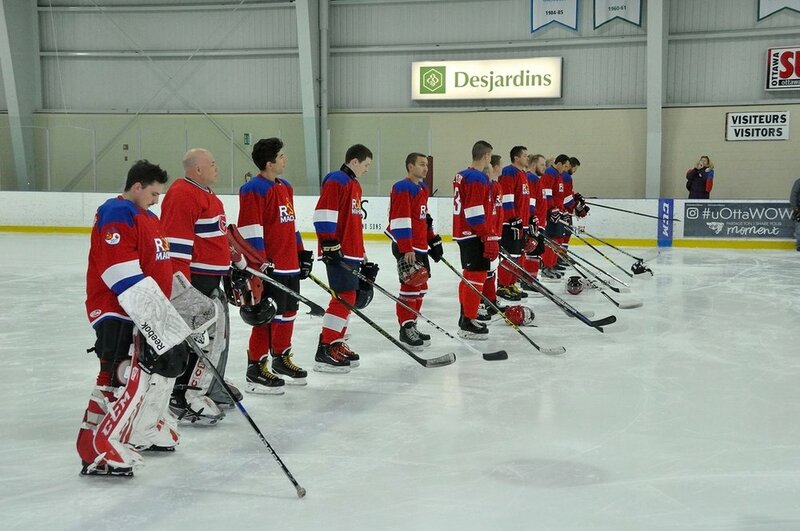 The Esprit de Corps Commando Lites also suit up their share of players borrowing skates and pads. Games are notable for their spirited competition if not speed. The May 29th Lites/Ducks Cup Challenge game was played at the University of Ottawa arena. Goals were hard to come by but the Lites chipped away to build a 3-0 lead late. (Katherine Taylor scored and assisted). Determination and persistence paid off for the Ducks and they added a second marker at the buzzer to finish at the short end of a 3-2 score. Although the ice time was two hours, five more minutes might have made a difference! Two days later the Esprit de Corps Commando regular squad faced off against the General and Flag Officers squad (GOFOs). With some senior officers unavailable, the Canadian military team called in colonels to fill the roster. As they are promoted the Commandos can expect difficult times ahead. Still led by Rear Admiral Bob Auchterlonie who registered two assists, the GOFOs struck first, second and third. Commandos Rob Hawken finally tallied a goal and brought to within 3-2 before GOFO’s Steve Caron added his second goal into an empty net. Played at the Bell Sensplex in Ottawa’s west end, the apres hockey was sponsored by Curtiss Wright who have a large facility nearby. They generously supplied food and drink to players and spectators while bright-eyed cadets sold raffle tickets. The Cadet Leagues were the recipients of over $5,000 in funds raised by activities around the Nammo Commando Challenge X. Esprit de Corps would like to thank and acknowledge all sponsors: Pratt and Whitney, DEW Engineering, Corps of Commissionaires, Airbus Defence and Space, Telfer School of Management, David Pratt & Associates, Rockwell Collins, Hudson Tactical, Rheinmetall Defence and Canadian Centre for Product Validation (CCPV). 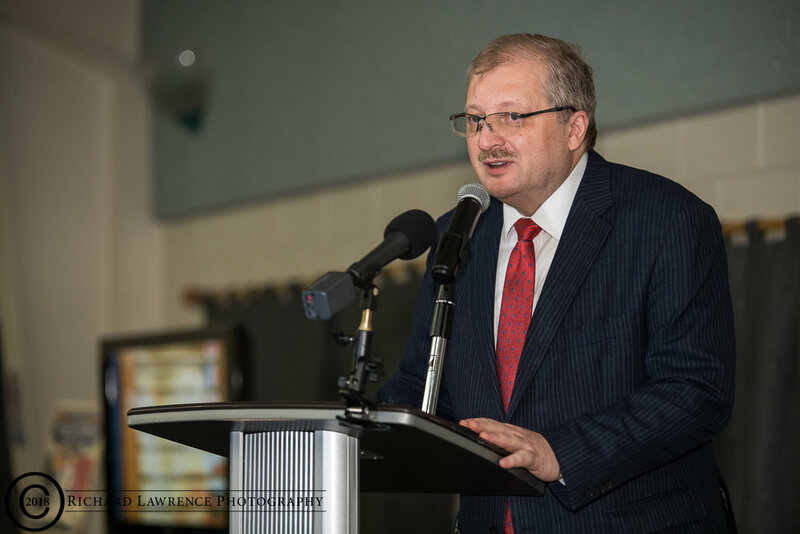 On February 9 the Embassy of the Russian Federation in Canada played host to an evening of fiercely competitive hockey in celebration of their Diplomatic Service Day in Ottawa. 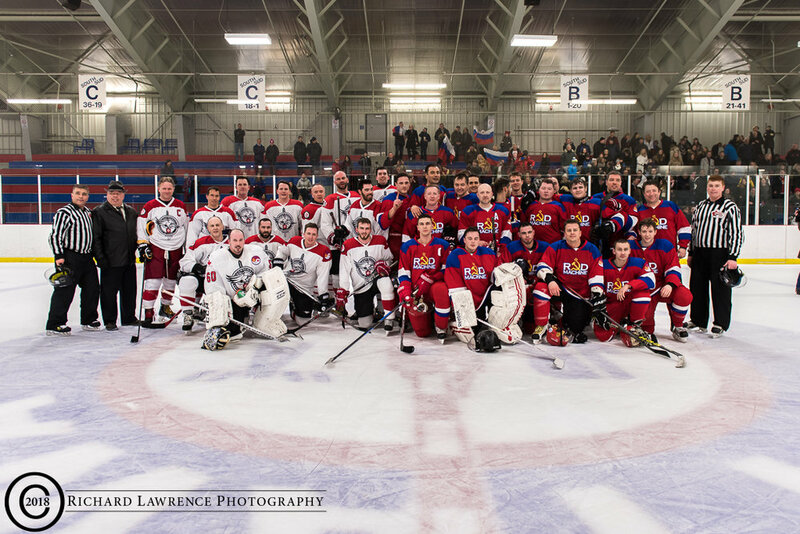 The Russian Embassy fielded two teams of their renowned “Red Machine” to play against the Esprit de Corps “Commando Lites” in the first game and the “Commandos” versus the Red Machine All-Stars in the second game of this double header. The games were played at the Jim Durrell Arena on a wintry Friday afternoon with the Russians dressing so many players for both games that there wasn’t enough room on their bench to squeeze in a photographer. For the first game both sides played with grit and determination. 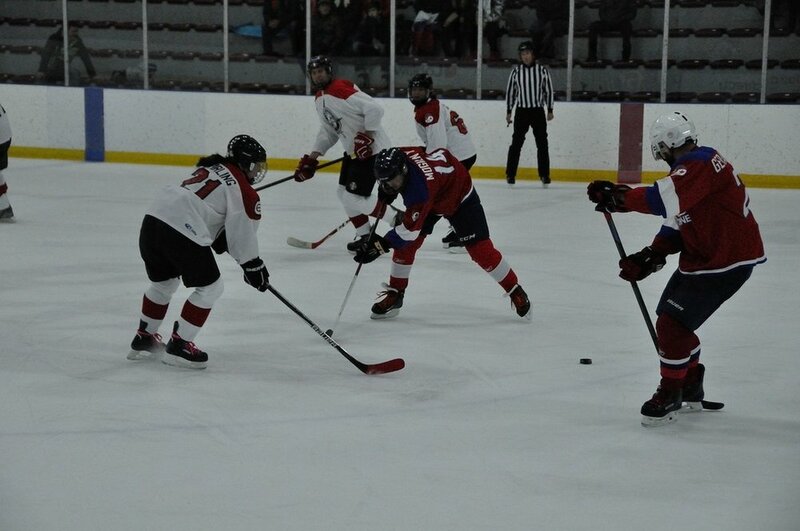 In the first period goals were scored on both sides – first by Commando Lite #3 Josée Lamothe. However, the Russians would answer back quickly with a goal from #68 Sergey Nekrasov. With slightly more than four minutes to go in the second period, a Red Machine goal by # 74 Yaroslav Zemlyachenko put the Ruskies up 2-1. It was with that slim Russian lead that they started the third period. Although playing aggressively, the Commando Lites allowed another goal, this time scored by #12 Denis Nayandin. With that third marker, the game was just out of reach for the Commando Lites. Final score 3-1 in favor of the Red Machine. 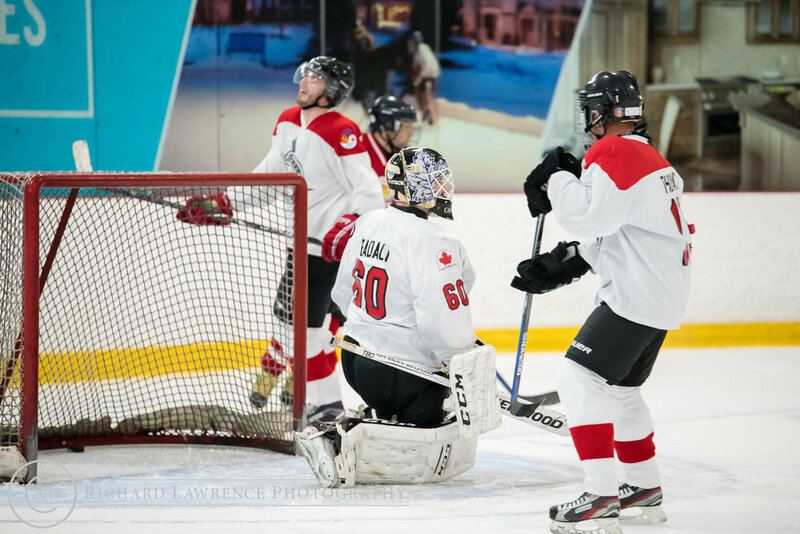 The start of the second match between the Commandos and Red Machine All-Stars was a hard fought and well skated affair with the first period ending in a 0-0 tie. Around half way through the second period, Russian sniper #13 Evgeniy Petrenko managed to pot a sneaky low wrist shot between the legs of Commando goalie #60 Scott Hopper. The score would not change after two periods – Russians were leading 1-0 heading into the third frame. 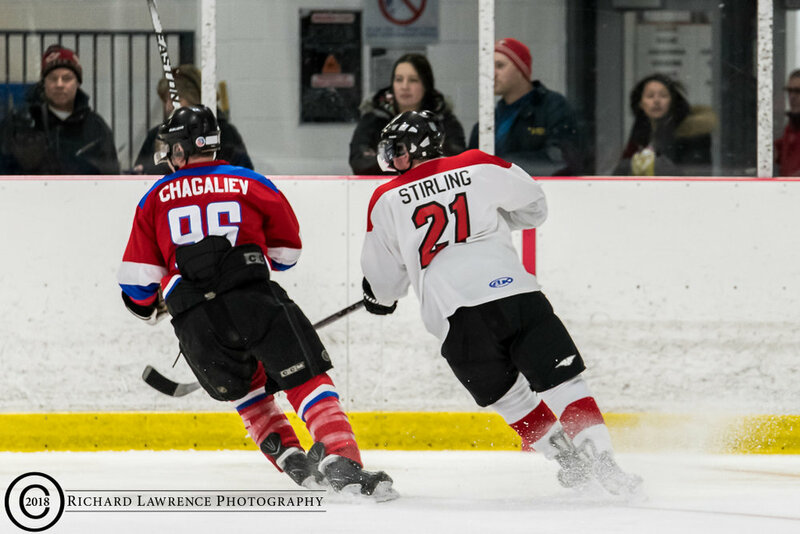 Midway into the third, Red Machine player #96 Ramil Chagaliev scored to set the lead at 2-0. A minute later the Russians netted another goal, this time by #28 Maxim Chipizubov. That is when the Commando MVP #77 Ryan Lediett decided to turn up the heat and with 3:18m left he sped up ice with the puck, dangled through the Russian defenders, and deked the goalie off his keister. Lediett’s goal cut the Russian lead to just two, and effectively hushed the crowd of predominantly Russian fans. The comeback for the Commandos proved to be a case of too little, too late. 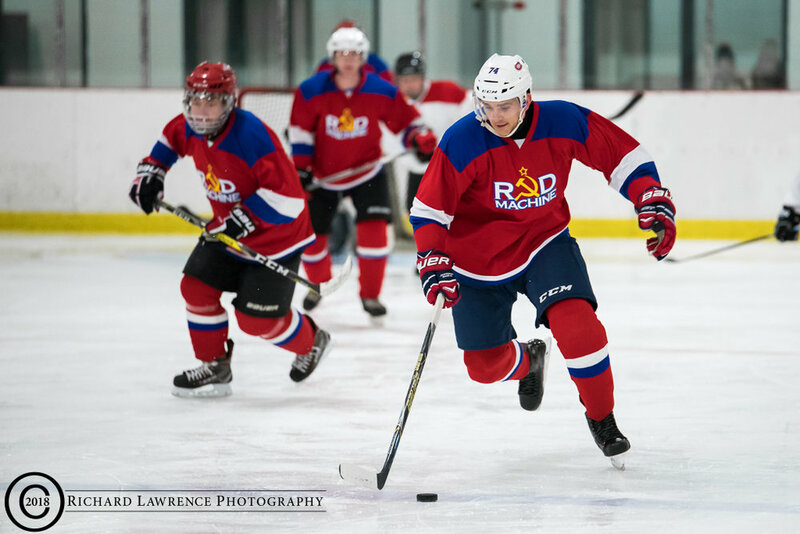 The Russians managed to score their fourth goal with just over a minute left to play, and that is how the game would end: 4-1 for the Red Machine All Stars. The crowd went nuts. 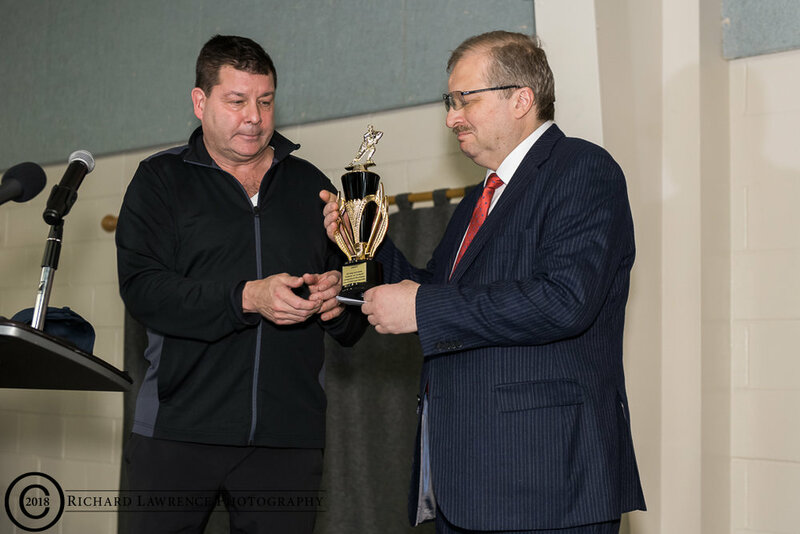 A well-attended reception took place after the game where the trophy was presented to Russian Ambassador Alexander Darichev by Scott Taylor of Esprit de Corps Magazine. 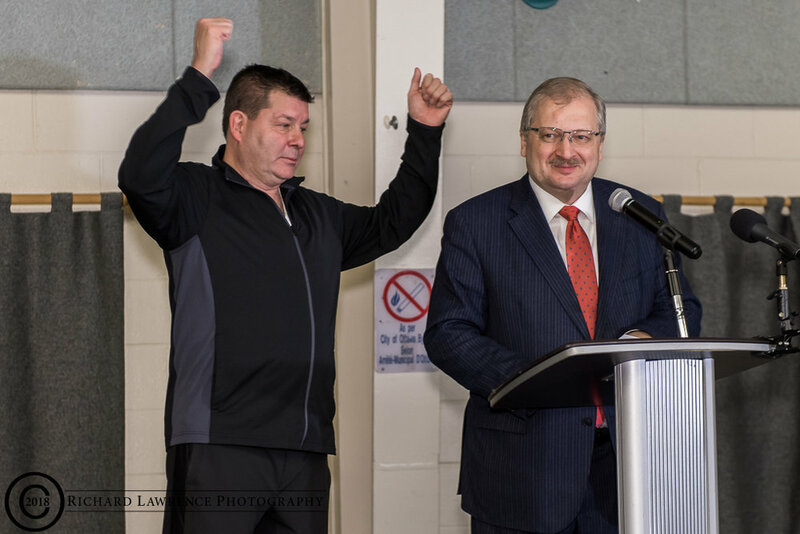 The top players were announced for both teams (two for the Russians) #12 Denis Nayandin and #80 Andrey Novikov and Commando powerhouse #77 Ryan Lediett. In addition, a new category, Dirtiest Player, was awarded to #91 Andrey Pisarenko of the Red Machine. Esprit de Corps wants to give a huge thanks to our Russian comrades for hosting such a wonderful post-game event, complete with mountains of food and refreshments for all of the invited guests. On Wednesday, January 31, 2018, four teams battled for two trophies in the season premier of the Commando Challenge 2018 hockey series. 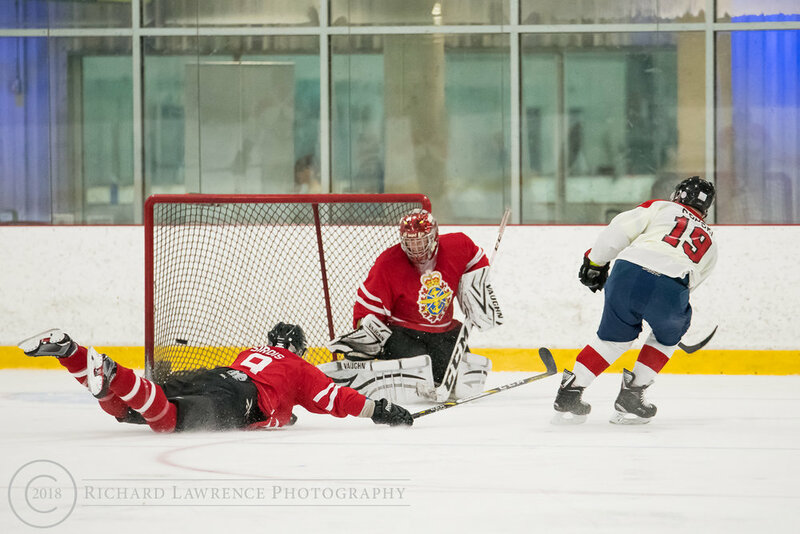 The first game of the double header took place at University of Ottawa Minto Sports Complex where the Ottawa Service Attachés Association (OSAA) Lame Ducks played the Commando Lites for the coveted Esprit de Corps Cup. The Lame Ducks were struggling to find their stride with a host of new players in the roster. The Commando Lites had an easy first period and after twenty minutes the score stood at 2-0 in their favor. Through two periods the Lame Ducks were trailing 4-0 and that gap would eventually close after a late rally by the desperate Ducks in the third period. Final score was 7-4 with Josée Lamothee, and Chinese Military Attaché Haifeng Wang taking home the player of the game awards for the Commando Lites and Lame Ducks respectively. 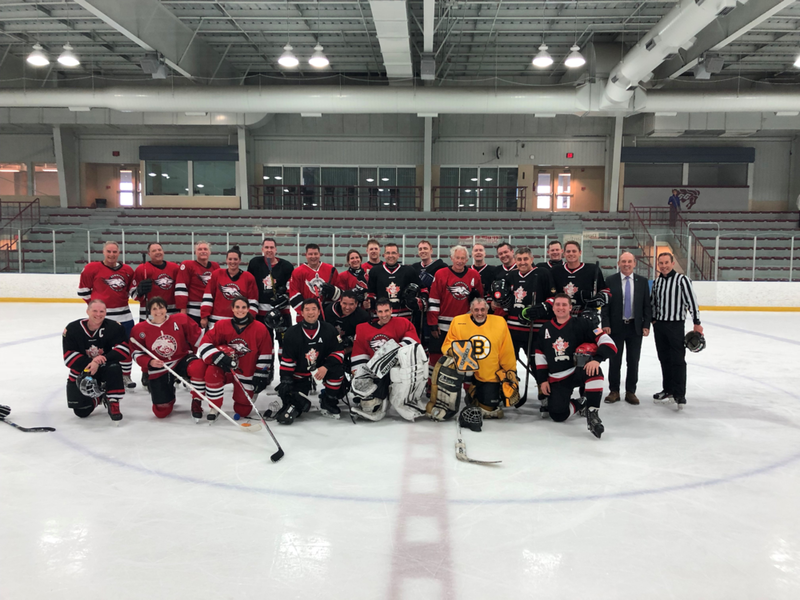 Across town at the McNabb Arena, the second game of the afternoon quickly turned into a heated on-ice battle between the General Officers & Flag Officers (aka the GOFOs) and the Esprit de Corps Commandos. The Commandos came out with something to prove after having lost the previous two matches to the GOFOs and managed to score a lone goal in the first period to take the lead. The GOFOs were missing three star players from their roster: Al Meinzinger, Bob Auchterlonie and Gilles Couturier and the lack of fire power from their top guns only became more evident as time ran on in the second period. After forty minutes the Commandos were leading by a score of 4-0. At this point each team took to their dressing room to rest while the Zamboni circled the rink to give them a fresh sheet of ice. No doubt the GOFOs had some chalk talk going on inside that room. They were determined to get a point on the scoreboard one way or another. 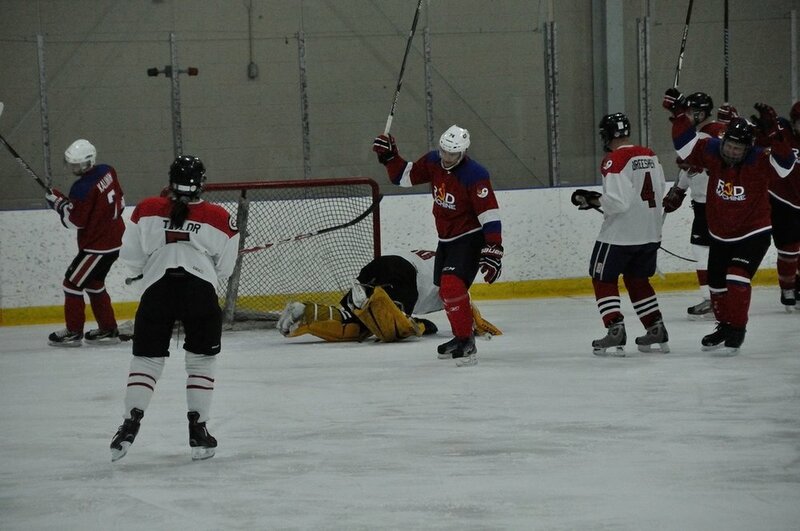 In the third period a reenergized GOFO squad managed to net one goal past Commando goalie Scott Hopper. But it was too little too late as the Commandos were able to fend off attack after attack from the GOFO offence. The final score rest at 5-1 in favour of the Commandos. The victorious Commandos have proudly reclaimed the coveted dagger trophy which now sits in Esprit de Corps’ office until the next match in May 2018. 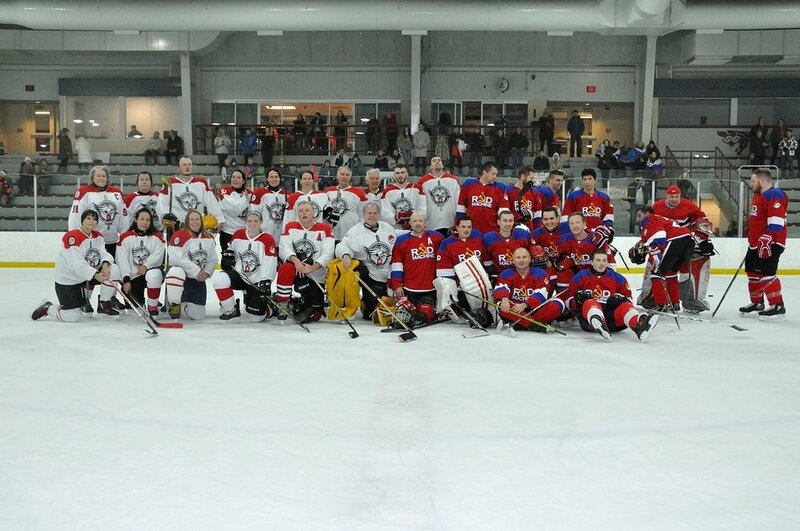 As with all the Commando Challenge events, regardless of who wins on the ice, the real winners are the military charities that these games support. For Commando Challenge IX, we’d like to thank title sponsor Nammo, and all of our contributing sponsors for taking part in this worthwhile event: Lockheed Martin, Pratt & Whitney Canada, DEW Engineering, Commissionaires, Airbus Defence & Space Canada, Rockwell Collins, Telfer School of Management, Hudson Supplies, Canadian Centre for Product Validation, Prospectus Associates, BMT Fleet, David Pratt & Associates. 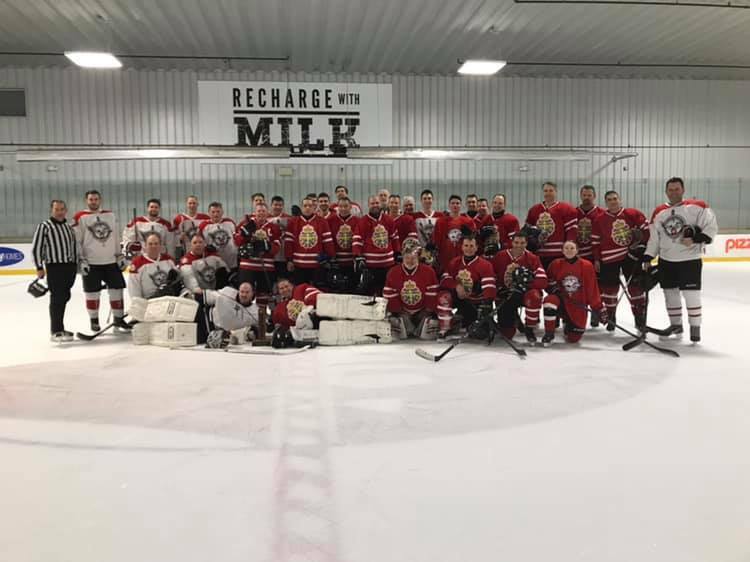 The January 2018 Commando Challenge game raised over $5,000 for the Cadet Leagues of Canada (Army, Air and Sea). 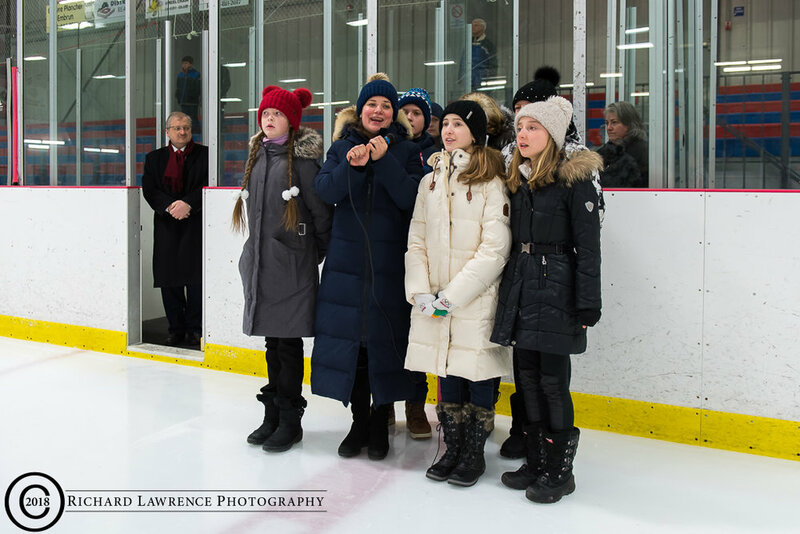 A hearty Bravo Zulu is once again sent out to the Cadet League organizers who were a huge part of the logistic support for the hockey game and the subsequent VIP reception. On November 18, the Esprit de Corps Commando-Lites and the Russian Embassy Red Machine came together at the University of Ottawa Minto Sportsplex to play a friendly game of hockey in the late afternoon – a precursor to the University of Ottawa military appreciation night game between their Gee Gees squad and Royal Military College Paladins. 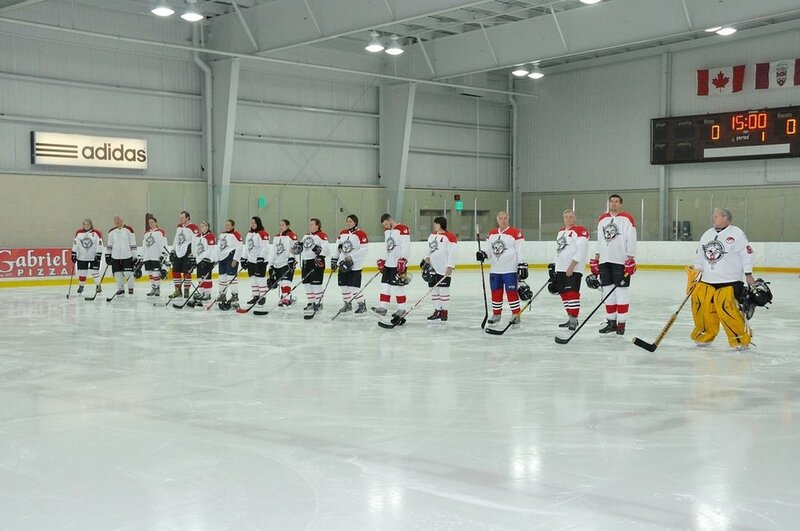 The Commando-Lites, captained by Esprit de Corps’ production manager Julie Simoneau have played several Charity Exhibition games to date, however the Red Machine was not their typical opponent. This time around, the Lites roster consisted of 9 women and 6 men, while the Red Machine fielded a full squad of cold-blooded Russian men only. The Red Machine came out with all guns blazing and managed to score a few goals early on with most of the credit going to their superstar player #13 Evgeniy Petrenko. 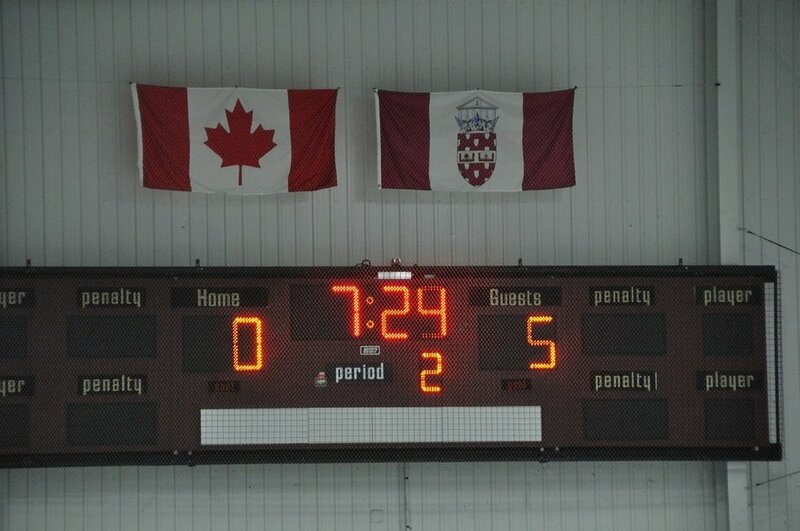 After two full periods the score was a very one-sided 5-0. 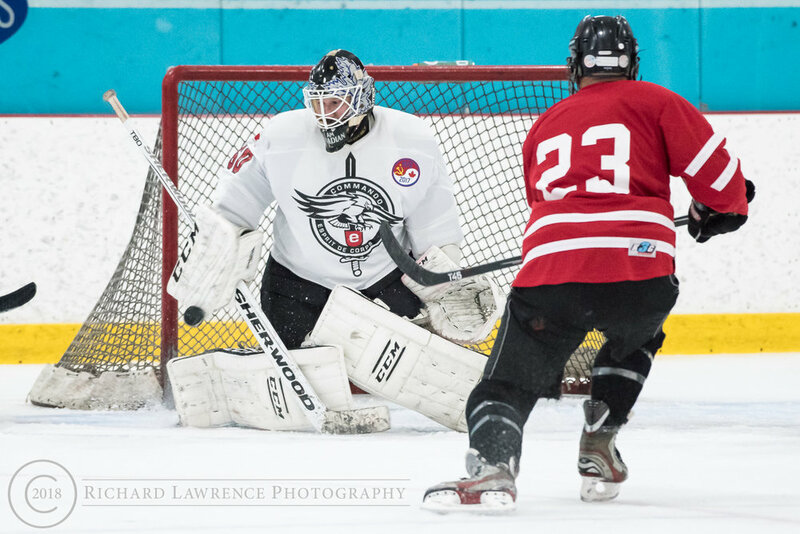 In the third period the Lites picked up their defensive socks, dug hard, and managed a handful of good quality scoring chances on Red Machine net. Unfortunately, the Commando Lites could not convert any of those chances into goals, and after another 20 minutes the final score did not change. Esprit de Corps can think of no better way to spend a cold November afternoon with our Russian comrades – playing hockey, drinking, eating, and forgetting all of our troubles!